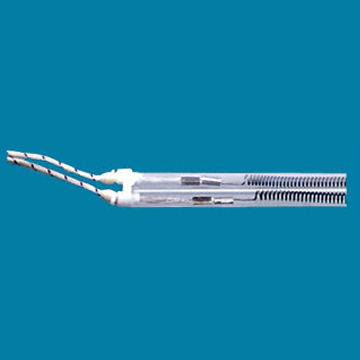 Our Twin Tube MW IR Heater is made up of 8-shape high-purity clear quartz twin tube, with each tube having Ni-Chrome heating coil that runs in U Shape in the tube. • Heating up and cooling down time is approximately 50 secs. •	Available with gold reflector and without reflector. •	The outer rear side of the tube of the reflector has the gold coating. •	Heat loss from backside is prevented by the reflector, thereby power is saved. •	Results in making surrounding work area cooler. •	Increases the efficiency and directionality of the heater. Standard sizes (in cross section): 11 mm x 23 mm & 15 mm x 32 mm. Power density: 60 KW / m2 can be achieved.